More and more, activists expecting to confront armed state actors – including intelligence officers, the military, and police – should be mindful of the skepticism and propaganda against them that is put forth by the national security apparatus. This is especially true for activists and humanitarian workers engaging in nonviolent action in the Middle East, namely, Israel. The conduct of the Israeli military and other personnel towards the flotilla passengers was not only disproportionate to the occasion but demonstrated levels of totally unnecessary and incredible violence. It betrayed an unacceptable level of brutality. Such conduct cannot be justified or condoned on security or any other grounds. It constituted grave violations of human rights law and international humanitarian law. There is some risk involved in this flotilla. The Israeli government threatens to board each ship in the flotilla with snipers and attack dogs. A year ago the Israeli Navy fired on the Turkish ship, the Mavi Marmara, from the air, then documented its passengers’ panicked response as their justification for executing nine activists, including one young U.S. citizen, Furkhan Dogan, shot several times in the back and head at close range. It then refused to cooperate with an international investigation. 1) Barricading themselves in the various wheelhouses and engine rooms (considered strategic locations) to make it difficult for the IDF to take over the ship. 2) Resisting removal through “going limp. 3) Bringing VIPs onto the upper deck to serve as human shields. 4) Throwing objects at Israeli Navy boats as they approach the ships, or at IDF soldiers. 5) Physical confrontation with IDF soldiers aboard the ships, using cold weapons (there were firearms aboard the Mavi Marmara, although the flotilla organizers deny it). 6) Spreading barbed wire and other obstacles on the decks to make it difficult for IDF soldiers to board the ships. 7) Verbal abuse directed at IDF soldiers and the State of Israel. 8 ) Causing difficulties for Israel after operatives have been detained (non-cooperation, refusing deportation, using legal tools and the media). Critiques of nonviolence often operationalize nonviolent resistance in an either/or fashion. If you are not completely nonviolent – which is to say passive, non-retaliatory, uncreative, a stoic martyr – you are considered violent. While violence and nonviolence might best be understood, from a tactical or strategic perspective, on a continuum, the state cannot conceptualize nonviolence in this way. Because state actors rarely understand nonviolence, every dissident is considered to be not just potentially violent but to be seeking an opportunity to use violence for its cause. The state is always looking to use force – as well as an excuse to justify its use of force by blaming its victims, as was the case of the Mavi Marmara. This is one of the reasons why transparency, training, and a steadfast commitment to nonviolence is probably an activist’s best defense against state aggression and violence. Consider the recent FBI raids of prominent anti-war activists in Chicago and Minneapolis. Or the historical cases of police violence used against groups like the Black Panthers. To be sure, the Black Panthers advocated armed revolution, but many of their members were targeted – or executed in the case of Fred Hampton – when they posed little or no actual threat of violence when targeted. All of this is to say that the state does not hesitate to use violence to suppress political dissent or protect their vital interests. 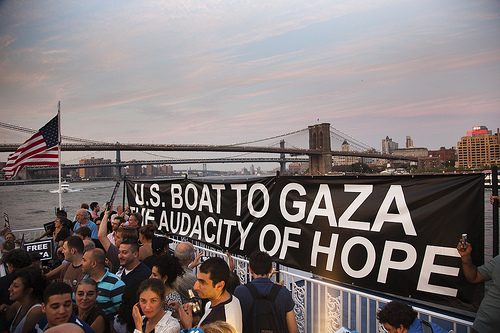 Israel and the Freedom Flotilla is no different. The IDF, as can be seen through the ITIC reports, will exploit any potential act that can be perceived as violent to be regarded as a threat to Israel’s security and IDF soldiers’ safety. In some ways, the threat of violence coerces one into nonviolence. From this perspective, it should be clear that nonviolence is employed not just as a tactic to gain momentum for the movement but also can be used to de-escalate the threat of violence and ensure the safety of both activist and opponent. Obviously, this did not happen on the Mavi Marmara. Such tragic, unnecessary violence – likely employed by Israel to deter future flotillas – cannot be blamed on the dead. What can be learned, though, is the utmost importance of methodically and clearly communicating ones’ nonviolent action – in word and deed – may lessen the outbreak of such violence when confronted by an aggressor. Let us hope that the Freedom Flotilla 2 can remain nonviolent in the face of extraordinary stress, pressure, and intimidation – both for their sake and the sake of the Gazan cause.